Description: Interesting difference in numbering and lettering on these two. Description: 2 Schemed SD70MACs pushing a coal empty out of the West side of Hobson Yard. Title: Green and Cream at Greenwich, OH. Description: BNSF 9781 rolls through Greenwich with a Coal Train bound on the ex-B&O main. Description: I was having issues finding the best Manual setting for this one, so i went with Auto, NO GOOD! Maybe this shot works better from a distance, but from up close with a low sun, not a chance! 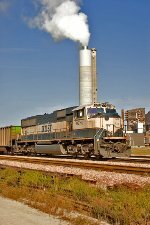 Description: BNSF Black Thunder Mine, WY to Iatan, MO coal train C-BTMSAI9-34 unloads at the Kansas City Power and Light Company Iatan power plant near Sadler, MO on the BNSF St Joseph Subdiivision. The inbound loaded train arrived with lone BNSF SD70MAC 9781 in the lead, 133 loads, 0 empties, 18888 tons, and 7060 feet of train with rear DPU BNSF SD70MAC 8833. Once unloaded this train will depart for Black Thunder Mine as symbol E-SAIBTM9-34. 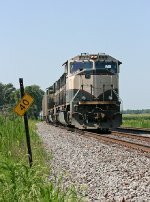 The 9-symbol on coal trains indicates a symbol change. This trainset operated from Black Thunder to Lincoln as C-BTMKCH0-34 where it was diverted from KCP&L Kansas City (KCS) to KCP&L Iatan. Description: Head end of BNSF Train C BTMSAI9 34 moves through the loop track at Kansas City Power & Light Iatan Power Plant. This train will depart in a few hours as BNSF Train E SAIBTM9 34. Iatan is located on the BNSF St. Joseph Sub. Description: Camp Meeting Ave. 0950 hours. Description: K040-15 crosses over onto the Trenton Sub single main at CP Wood with a three pack of BNSF units leading. Description: BNSF ES44DC 7654 plus an executive SD70MAC and ES44C4 lead K040-15 west through Woodbourne with a long train of Crude Oil. Description: The previous day's K040 power turns on K041-18, seen here charging east through Woodbourne after it started raining with BNSF ES44C4 leading the executive SD70MAC and the ES44DC.